1. What is PST and OST ? 2. Can we run the software on Windows XP machine? 3. Will it work without Outlook installed? 4. Can I open attachments? 5. Will OST PST Viewer help me view the corrupt PST files? 6. Is it possible to view all the specific contents of my PST file using the software? 7. Can I export emails? 8. What is the differences between Free and Pro versions? PST is an acronym for Personal Storage Table. This file format is used by Microsoft Outlook Application to store user's data. OST is an acronym for Offline Storage Table. This file format is used by Microsoft Exchange Server that enables users to work with their messages and mail data even when access to the mail server isn't available. Yes, you can. OST PST Viewer is compatible and works great with all the versions of Microsoft Windows OS such as 10, 8, 7, XP (Microsoft .NET Framework 3.5 required), Vista and Windows Server 2003 / 2008. Yes. 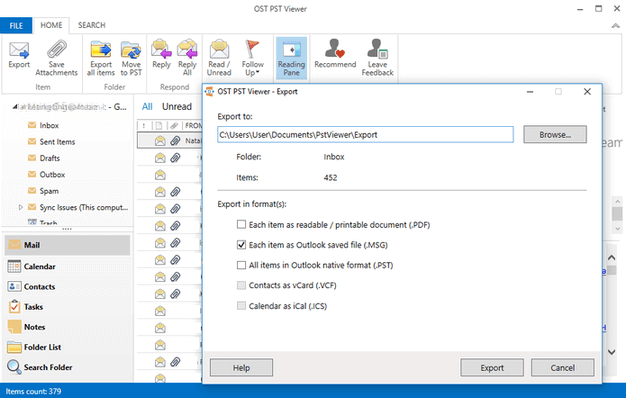 OST PST Viewer is independent software, which operates without Microsoft Outlook installed. Yes. You can open attachments directly from OST PST Viewer. Yes, the software lets you view normal as well as corrupted PST files. Yes. The software displays every fragment of information stored in the PST file. You can easily view all your messages, contacts, calendar items, etc. In addition to this, you can also view the metadata information of emails such as To, Cc, Bcc as well as date and time when the email was sent or received. Yes you can. OST PST Viewer supports popular file formats: GIF, TIF, BMP, JPG, VCF, ICS, MSG, and MHT. Export emails, contacts or appointments. Click here to see the differences. Works with all PST files starting from Outlook 2002 and all OST files IMAP, Exchange, Exchange ActiveSync.